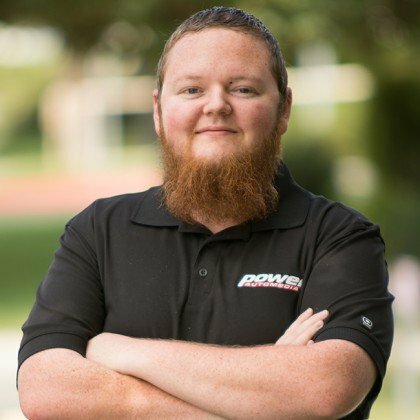 Both Kutscher and Weismann are the owners of Traction Products Inc/Weismann Marine LLC, based in Costa Mesa, California. For over 51 years now, they’ve dedicated their expertise to becoming a world leader in innovating everything watercraft, marine, and road racing related, specializing in transmissions and custom designed watercraft parts. It’s obvious the passion they have for their business has bled over into their own boat. K&N Filters was enlisted to build custom air intakes for the paired LS7 powerplants. The transmission he is referring to is the one they’ve engineered and manufactured for use in trophy trucks and a supercharged LS7 swapped Ferrari 360 (among others), that has a history with the Indianapolis 500 that dates back to 1963. Designed to fit within the confines of tight spaces, this unit provides some serious torque handling capabilities for any application, not just road vehicles. “The WBD [6-speed automatic transmission] was engineered as a unit,” Weismann explains. 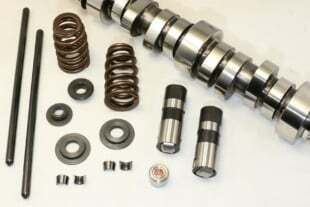 “The internals can be coupled with the WHT differential section, and be made into a transaxle. It can also be made into a 4-wheel drive system with the addition of a drop-box. We made a special case so the trans would bolt to the drive on our boat. As you can see, it’s been designed for versatility.” We think it’s safe to assume, you can now add ‘twin LS7-powered boat’ to the list of compatible platforms. Details on all of the transmissions Weismann offers can be viewed on their website. 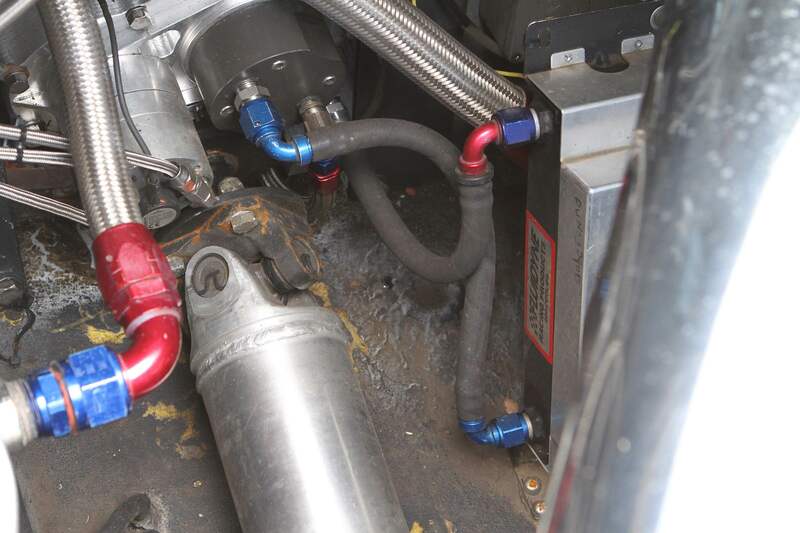 Dry sump tanks increase oil capacity and keep the engines fed during long stretches of acceleration. 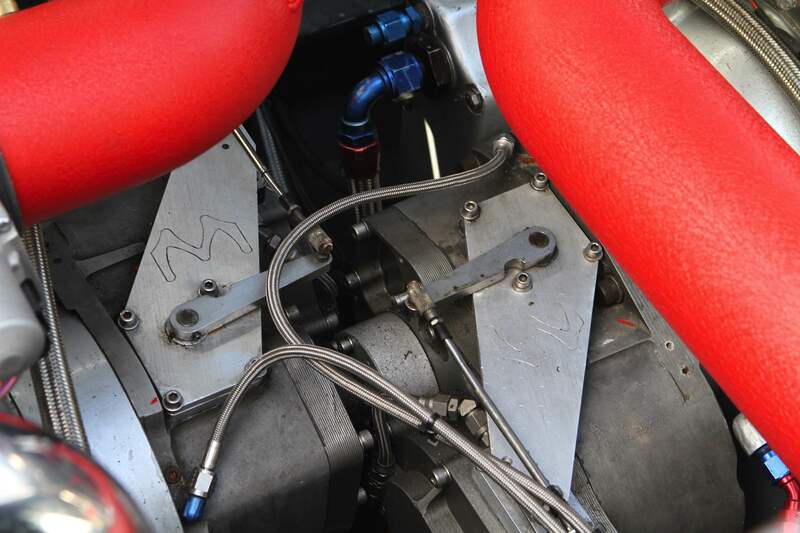 The engines are installed flywheel-to-flywheel, with offset gearboxes transferring power to twin driveshafts, then to the six speed transmissions and drive units. 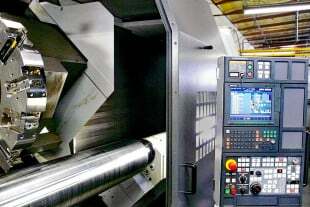 The inline layout has several advantages over a typical side-by-side marine installation; it allows for a slimmer hull and fewer issues with header clearance, and putting the engines back-to-back means one of them doesn’t have to be set up to run “backwards” (turning counter-clockwise when looking at the crankshaft from the front of the engine) or have an additional gearset to counter-rotate the props. 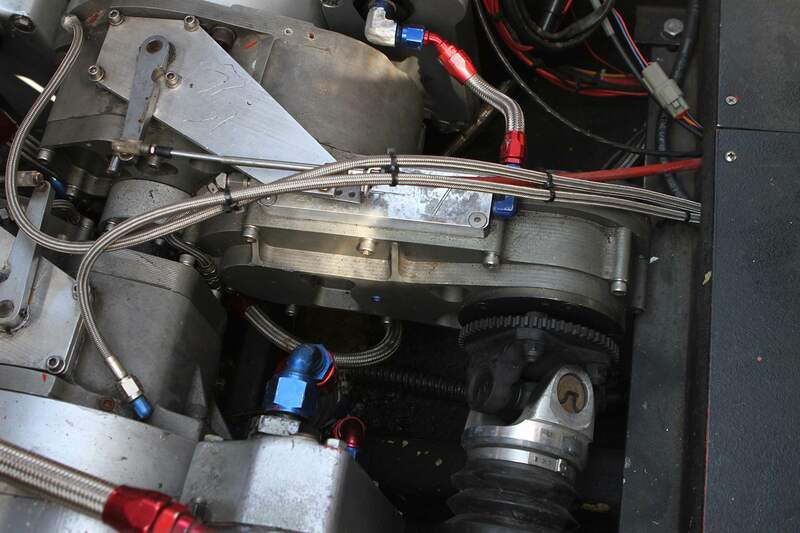 It also makes it easy to place the outdrives closer to the center of the boat to improve handling. 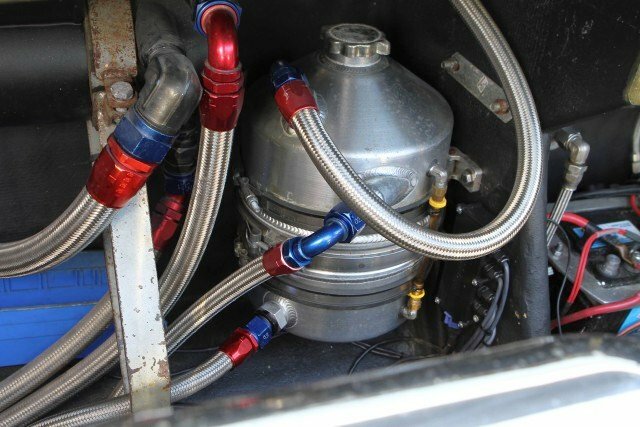 Custom water-cooled headers carry away exhaust gas – like many other components on this boat, they’re designed specifically for this application. Weismann goes on to add that both motors are fitted with LS9 rods, LS9 cranks, forged pistons, Chevrolet Performance DA camshafts, ceramic ball hydraulic lifters, and other supporting valve-train parts. Weismann says that combination is good for 660 horsepower and 547 pound-feet of torque, per LS7. “The popular motor to use is an LS2 6.0 liter that has been supercharged, or a typical big block swap with a supercharger or turbocharger is the other way to go,” Weismann admits. “With a supercharged or turbocharged engine, you’ll need an intercooler, good fuel, and to utilize an LSx iron block. Our old supercharged big block setup weighed in at 1,400 pounds [per engine], while our new one is only 536 pounds.” Though the weight advantage is clear, we can’t help but think to ourselves that it’s expensive enough building one LS7 with quality OEM and aftermarket parts, but two? 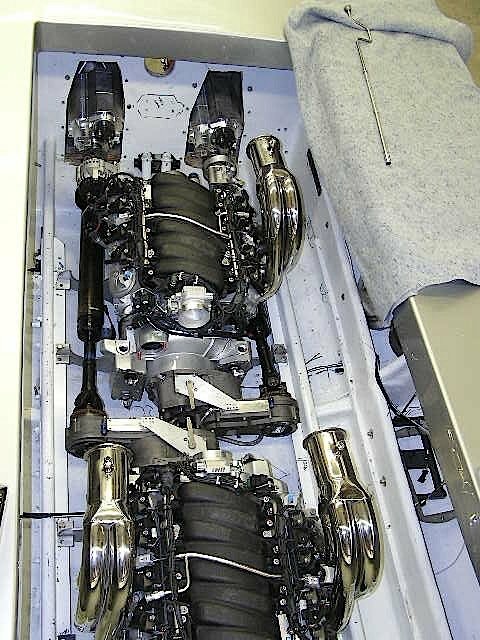 Initial installation of the twin LS7 engines. After deciding against forced induction and in favor of natural aspiration, there were still some complications Weismann and his partners had to overcome during this build. “There were no marine parts available, like water cooled headers, water pumps, serpentine belt brackets, closed-circuit cooling systems, engine mounts, or a self contained engine harness.” That’s when he realized he was really going to have to improvise and call in some favors. 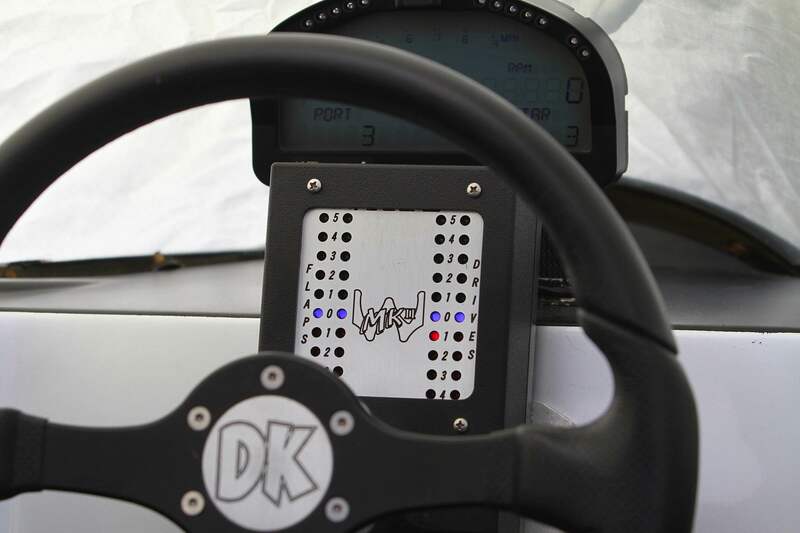 Companies like Racepak and MSD lent support to their project, providing the proper electronics and their Atomic LS EFI to handle the boat’s engine management needs. 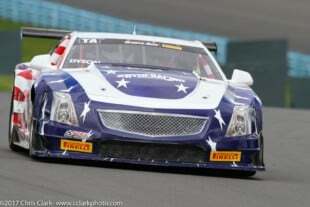 The boat also sports custom air intakes provided by K&N. In line with common offshore racing practice, one man handles steering while the other controls the throttle, but the boat's cockpit is laid out so that it's possible to drive solo. 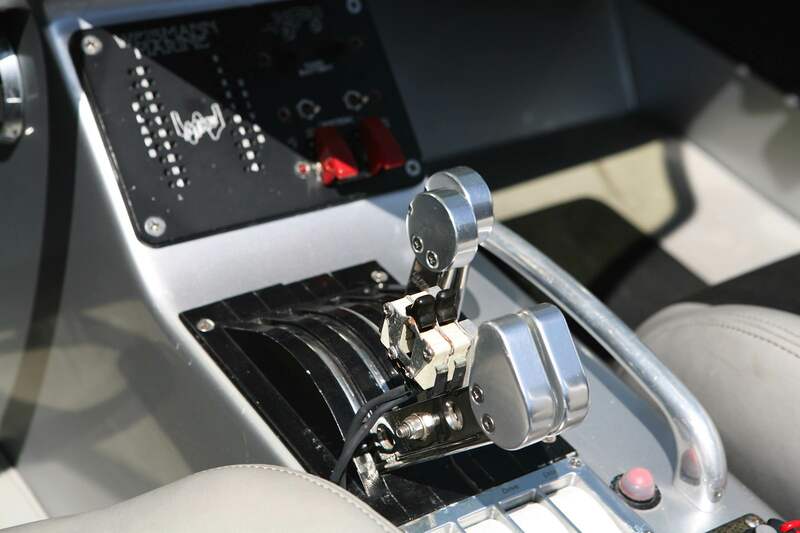 Separate controls adjust the angle of the drive units and the trim tabs. Keeping the boat trimmed out for minimum contact with the water while still maintaining the nose pointed at the right angle is the key to maximum speed. Kutscher and Weismann share billing on the long, long bow of the offshore boat.